Mr. Smith is the 5th grade teacher at Calvary Lutheran School. He was born and raised in Rockford, IL. He graduated from Concordia University Wisconsin in 2004 with a Bachelor Degree in Elementary Education and minors in Language Arts and Theatre. Dustin has taught many grades from Preschool through 5th grade. He has taught 5th grade at Calvary since 2005. 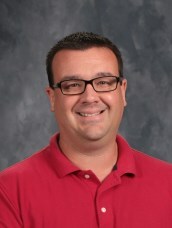 Mr. Smith loves to use technology as an aid to help kids learn and have fun in school. He and his wife have two children who attend Calvary.